The Sakurada siblings live a normal life in a typical Japanese household. Well, that's what their father, the king, wants for them at least. As members of the royal family, each sibling possesses a unique ability, and over two thousand security cameras have been placed around town to make sure the children are safe and sound. Moreover, all nine of them have been designated as a potential successor to the throne with the decision that the next ruler will be selected through an election. However, for the timid Akane Sakurada, the third eldest daughter who wields the power to manipulate gravity, all of this attention is a complete nightmare. With all the cameras constantly monitoring the candidates and even broadcasting their actions on the Sakurada-dedicated news channel, she decides that if she becomes king, the cameras have got to go. But just how will she convince the public that she is the most suited to rule if she can't even overcome her own shyness?! Election season is in full swing as the search for the next king begins in Joukamachi no Dandelion. Since the source material for the series was still ongoing, the Joukamachi no Dandelion anime was given an original ending. Joukamachi no Dandelion is a rare series in the sense that it is effectively the anime equivalent of a celebrity variety show. Originally a 4-koma manga, the story follows the royal Sakurada family, consisting of the king and queen as well as their nine children. However despite the tiny country seemingly being a monarchy, the actual decision on which one of the princes and princesses will become the next heir to the throne is done by an entirely democratic process. They have to go campaigning in the streets and make political speeches in order to attract voters and then hopefully win the upcoming election and thus become the next king. To aid this, there is a total of 200 security cameras distributed throughout the town which follow the Sakuradas’ every move and broadcast it immediately on national TV for the population to see. So it’s basically a sitcom in that sense. To add to that already quite erratic premise, all the Sakurada children also have their own individual super powers for whatever reason, including gravity control, instant learning, teleportation, object creation, mathematical future prediction, self-cloning, manipulation of biological growth, superhuman strength, as well as communication with animals and even inanimate objects. In short, there’s a lot of variety in this anime and it does a surprisingly good job at giving each of the Sakurada siblings a respectable amount of screen time and characterization. Because of its 4-koma origins, the anime consists of many smaller parts and most of the episodes are divided into two, sometimes even three short stories instead of a single one spanning the entire episode. Despite this however, it still manages to progress the overall election process fairly well throughout the anime. The shorter segments also mean that the large number of main characters still all get a decent amount of storytelling dedicated to them individually, which helps a lot. I don’t think you can really call anyone a protagonist in this story, but the one who gets the most screen time is Akane. She’s a very typical HanaKana moeblob who is pretty much the spitting image of Onodera Kosaki to me. I have a bit of a problem with her in the sense that she’s so unbelievably shy that sometimes when she gets embarrassed even I’m starting to feel awkward just by watching her, which ticks me off a bit. But either way there are a ton of characters in Dandelion so I’m pretty sure everyone will find at least someone amongst them which they can grow fond of. Overall, Joukamachi no Dandelion is hardly a masterpiece by any means, but it manages to stand out a bit from your typical slice of life comedy due to its unusually hectic premise and story. If nothing else, I have almost nothing straight-up bad to say about it, which is more than I can say for most anime. Joukamachi no Dandelion;in English, Castle Town Dandelion, is an incredibly enjoying and fun anime to watch. Despite the story being simple, the show manages to bring out elements of development throughout the entire series, which many animes have failed to do so. The Story is simple. Even though the Super Power Genre has been added into the series, it was used very differently compared to other animes, the story does not revolve around the super power, but instead on the daily lives of the 9 characters. Hence, the 'Slice of Life' Genre. The sound used in the anime befits the anime a lot, the OST are cheerful, and fun, or perhaps at times calming. These OST are used properly at the right time, the OST had never felt or sounded weird to me even once, so it's definitely a Plus to the anime. The Opening and Ending are really catchy as well, I've never skipped it even once, hopefully many of you will think so too. The Art is just... magnificent LOL. The art is incredibly consistent and bright, it's incredibly pleasant to look at, and it also brings out the Moe of the character to it's best. If you're looking for an anime with really good art, this anime certainly wouldn't fail to reach your expectations. Now for the main factor which led to me giving a high score to this anime... the Characters. The Characters are simply unique, even though their types might be common and seen all about in the anime industry, their personalities differ from these types, and their added sense of duty and responsibility also further shines upon their character. Each character are different from the rest, there is never a character whom I found boring, from the Benevolent Shiori, to the Shy Akane. Personally, Shu is one of my favorites in this show, his character varies a lot, he's not Denser than the periodic table like the majority of the cohort in anime, nor is he one dimensional. In fact, he consistently displays a unique approach towards dealing with things, which aren't easily seen in many animes nowadays. And Most importantly, all the characters develop throughout the series from experiencing things, so they're never constantly displaying the same attitude nor behavior throughout the series, which is a Major Plus for me, as I tend to determine a Show's true worth through it's characters and their Development. In Conclusion, I'd Highly recommend this anime to anyone who enjoys Slice of Life, or wants a peace of mind from their stressful lives. It's a two story in one episode, but it was executed well. The story is very Simple, but the Lessons you can get are the Hidden Message of this Anime. It's very good, the execution is well done and the plot is not all over the place. The story is very predictable, but the characters aren't, they've changed a lot. In terms of Adaptation over Originality, the Anime is way better, and the pacing is good. It's an anime that focuses on Character Development and Supernatural Slice of Life, but the Hidden element of this story is the best, Being a Fun Royalty. So far they've used Flashbacks, First-person Narration and Magical realism as their literary techniques. The Ending was Epic, It was one of the Best! The last episode have shown Principles and Dignity, and the best Conclusion to close the Anime, Overall it's the Best Slice of Life you can get this Year. I love Anime that can bring up their Specific genre, and to make an Unexpected Events, and this one was able to Check that Box, The box of Unpredictable Events, Anime with Sense, Nice comedy and not exaggerated, One of the Best Light Series This Year. If this is a dark anime, this is Par on Fate/Zero, which the Dark Version of this one. The art is clean, it meets the expected standard of an anime. The art was able to express the fitting mood, especially the characters expression. And it fits in the Story. They didn't mixed any CGI or Live Action Clip, mostly 2d with few 3d art styles. The art style is very clean from the start, and the Background and the fits the anime, especially for the beautiful scenes. The Character Design is the Best Art in this Anime, they fit so much that it will make you smile when you see them. The Character Design is unique, and none of them are repetitive, or based on other works, they've even showed the genealogy of each character, which makes me smile. The Characters have the Best Voice Actors/Actresses, they fit so much that it will make you happy. And I think, the seiyuus enjoyed this short anime. I wanna see them playing their role outside the anime studio or during it's record. The opening and the ending song are really Light, they promote Happiness. Though it's not catchy for me, because I love Dark and Metal Songs. The characters here are the best, They have their own personality with Strength and Weaknesses, and most of the time, they will make you smile. The characters always react in realistic way in normal circumstance, but as I said, it's a supernatural anime, but they've used their power in the realistic way. And the Best in this Anime, is the Character Development. They've developed so much more than what I expected. They've conquered their own weaknesses and was able to changed for better. And they were able to show their Dependable side to people. Though I didn't see any antagonist in this anime, the siblings fight for Royal Candidacy, but they fight Fair and Just. But there's no Psychological and Action in this anime, just plain Supernatural Slice of Life. The Supporting Characters can par against the Main Characters in terms of Role Playing. They were able to produce the best fitting Supporting Characters needed for some occasions or scenes for each Main Character in this anime. They've have used First Person Narration: the Main Characters are ones who narrates the story. The Characters are very Likable, you will love them because of their Values, each of them have developed in the story, better than I expected. The people who loves Comedy, Seinen (Philosophical), Slice of Life, Super Power will love this. I think this one fits for Teen Newbies, or non anime fan. This is really good if you want to watch some scenes, or to re-watched the whole anime. And I think it is still enjoyable to re-watched this anime even it is predictable. This is an Anime that should be stored/remembered as a Relaxing/Happy/Light Anime. The Values(Philosophies) of this anime is the bests that marked my mind/heart. But I think I might forget this anime, but not the character's principles and the Family. I've just watched this to kill time and stored this for comedy relief if I will read/watch Dark and Intense Manga/Anime. How it was DONE. IT did the Best Thing it can Do. this is already a Good Score in my Rating Style. It was able to bring out its Potential in this Manga. Art meets the mood, sometimes it can create a misunderstanding like "Twincest" which is not really true, and the sound was able to enter its scene especially in the Romantic Scene of Shuu. the story is nothing special but it's relaxing, but the Character Development is something that should be present in Many Animes and Mangas. It has Philosophical Values and was able to simplify it for general audiences. This anime is worth for its Philosophical Aspects that are not present in many animes. It was Able to turn almost all characters in 180 degrees. It's an example of Characters>Story/Art/Sound, so I really Enjoyed this Show. 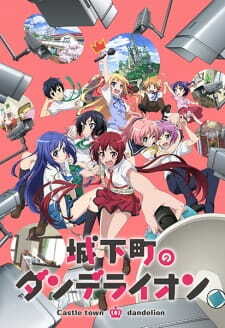 This is a Recommendable Anime. just go to my account if you're Curious about my Rating Style. It’s not often you’ll find an anime where a cast so big is utilised so effectively, where everyone gets a decent amount of spotlight, as well as development. It doesn’t stray with excessive filler, and stays on point to the story, which is the election. With comedic elements and a little bitta eechay, the absolute best thing about Joukamachi is its characters. Each sibling is fitted with their own unique personality, design, interaction as well as powers. Although simple, their powers add much to their development, as well as make the show highly entertaining to watch, apart from your typical slice of life story. What makes this anime super fun to experience as a competition is that they’re family; you will probably rarely ever see interactions of this kind in other anime of similar concept. While they are competitive with each other, they still need to support and care for each other as siblings. This creates important bonds such as those found between Haruka and Misaki, Shu and Kanade etc. It’s not super obvious from the start who is going to win either; the anime manages to keep you guessing. I doubt that a viewer will know from the beginning who does win. At the same time, it also pretty quickly reveals who is serious about the election, and who is not so serious (as well as unlikely). Important to note that it’s an original ending, and the manga is ongoing where the election process is actually 3 years. The oldest sibling, remaining to be the most popular candidate until the end. It is also contradictory that the person who is most likely and fitting to be king (given her powers), doesn’t want to be king. The anime makes Aoi interesting in that fact that she lies about her power initially, even to the general public. Souichiro also decides to keep this a secret and takes pride in that she does not want to be king due to her actual powers. Despite this, this lone fact makes her so strong and convincing as a character; she has no reason or drive to become king, as the election has made her notice what is truly important to her. She does not seek fame, attention or power, but simply craves meaningful and genuine relationships with her friends. The realisation that she could get anyone to do anything for is, in her view, wrongful. It has made her cherish normal relationships as well as a normal life. The anime does keep us guessing who it is that will end up being king, unless you anticipate an open ending, but anime working towards a final outcome tend not do this. However, Shu being king really does make sense; he is the oldest male in amongst his siblings; he has had a queen in Hana since episode 2 (also giving him a reason to become king); and by the end, is overall the most fitting. Joukamachi covers this eventuality up nicely making Akane very clearly the main character, but also Aoi being first place for the majority of the election and Shu taking a backseat in votes. Shu’s power also seems to be more utility based than anything, still very powerful, but not one suited for ruling like Aoi or Kanade. It’s also another irony, in the fact that his power is based around instant transportation, yet his actual mobility is limited by his injury. Ultimately it makes sense for Shu to become king. In the end segment, he got his final speech in and showed what mattered to him most – ensuring the safety and happiness of all the people he cares about, that being his country and loved ones, and proving this by taking initiative in the hot air balloon incident. Not to mention, he looks exactly like his dad when he was younger. Kanade had been the fiercest competitor since the start, but ultimately had selfish reasons for doing so. She’s shown to be a character who won’t stop at getting what she wants, which is befitting of her power where she literally can. Despite this, it’s ironic in that fact that in some scenes, she’s seen shopping just as any other ordinary citizen. She excuses that menial tasks also mean more chance to be in the public eye. Kanade is all about efficiency and is a very forward-looking person, at times manipulative. Kanade does not like uncertainty and wants to prove to Haruka that probabilities are not just probabilities. Even though this is the case, the reasoning behind all her actions is more fragile than you’d think, though does still make sense. Not only wanting to help Shu, she more so wants to be seen as an equal, being Shu’s twin. However, in the view of Shu, the older brother must always take care of the little sister, which is also true of Haruka and Misaki, as well as Teru and Shiori. Is voiced by KanaHana, but I don’t actually care this time, it fits. I think Akane is a really good main character. I often like anime that put emphasis on the side characters but follow the story primarily through one character’s perspective. Akane is the main character, but the anime doesn’t make this overly obvious, and doesn’t put the greatest emphasis on her. Her role in the story is to tie the rest of the family together and provides middle ground for all characters to interact. By the end of the election, Akane’s development is sound. In the end, she seems much more comfortable in public due to the realisation that as a public figure of royalty, she has a duty and responsibility of ensuring the safety of her people and that the payoff of doing so is heavily rewarding. Hiding behind a persona is now unnecessary for her. Although maybe not taken seriously, Misaki is also a genuine competitor to the election. She may not have what it takes to become king and may not have a true reason for doing so, yet still feels a need to prove that she can become something. Unfortunately, the anime keeps it realistic in never giving her the top spots in votes, however this had gradually motivated her to become more serious about herself and the election throughout the story. Misaki decides to do speeches on her own rather than relying on her clones, as an example. She is an interesting addition in the fact that, while she is shown to be highly useful in day to day life and has a wide coverage of being able to do basically anything with her powers, she herself is not capable of much. However, Haruka sees this as a good thing; she is not highly gifted in certain things and may see the world better in the view of an ordinary person. She is best suited at doing comparatively unimportant tasks, but this is all the more important when her siblings are focused on other things or just aren’t as good as Misaki in a social sense. Also, an interesting addition to the story. Haruka could probably foresee who would win the election throughout the entire process and could’ve actually used that to his advantage to potentially win. However, Haruka remained to be level-headed and realistic about what he himself is capable of, and that he lacks the confidence and drive to put himself in the spotlight and campaign. Instead of this, alongside his powers of prediction, it grants him perspective of whom it would actually be reasonable to become king. He is serious in helping others campaign, knowing that he himself would not be competing, and proves to be reliable on this front. He aids Misaki in assisting her with her confidence issues, proposes to write Misaki’s speeches as well as helps Hikari become an idol. Haruka’s role is especially important, considering how it has helped to develop the other characters so massively, especially Misaki. Hikari’s development stands out from the rest. You would expect Hikari to be a character that provides comedic relief and moe, but instead brought a meaningful perspective into the story. She was the only one who found what she wanted to do in the future other than becoming king. What started off as a basic idea to gain votes became her actual goal, heavily influenced by Sacchy. It’s interesting in the fact that she had such talent and intuition at such a young age, mixed with her power to mature whenever she wants, it’s almost as if she was born to do this from the start. By the end, Hikari no longer cares for the election, and deems her pride as an idol much more important to not only herself, but her fans. She realises this after her interaction with Aoi, who explained that a lie will remain a lie if you believe it is, which was a struggle that she herself had to face. Being an idol also contrasts the position of king. As she mentioned in the series, idols are not supposed to be perfect and may make mistakes, which ideal and preferable kings have a duty in avoiding. This differed from the clumsy Hikari, who would not take anything seriously when she didn’t feel the need to. By far the most righteous and respectful character in the story; Teru always refers to his family in a formal manner. His personality is consistent and convincing, Teru feels as if he’s limited by his age and insists on helping out in whichever way he can. His power is potentially the most powerful and reckless, however this is restricted as well as contradicted by his young age (therefore a ‘weak’ social standing in contrast) as well as the promise made to his mother, to which he remains honourable. This makes sense, as kids should listen to their parents(!). Teru can’t be taken seriously in the election but even so provides a refreshing perspective of a cool shounen type main character faced with ‘trials’ throughout the process. (did you see that last episode? Wow.) Also has a strong sense of duty to protect those important to him, especially Shiori. Shiori does not take part in the election, but dandelion is aware of this. Most of her role entails taking care of her siblings, to make sure they don’t go overboard in the election, and to take proper care of each other and themselves. It could be said that she cares more about others given the fact that she can communicate with anything, hence meaning she’s more considerate of the ‘feelings’ of everything around her. This also adds a comedic aspect; for example, her powers legitimately give a voice to their family cat, Borscht. In the end, it proves to be an extremely useful power which reinforces her ‘support’ role in the series. RIP Suika-san. It’s worth mentioning that Souichiro is also a key aspect in this series. He decided to hold the election at the end stage of Aoi’s high school career, as this was deemed by him the best time where the majority of his kids had a decent chance in becoming king. However, more importantly, it was a time where they could decide what they wanted to do with their lives, and to decide where their true ambition lied. With Hikari, this was an especially effective method. There are other cases as well, such as Aoi simply not wanting to become king even given the opportunity in trade for a normal life, as well as Kanade who changed her reasoning towards the end of the anime. He always grants permission and is a fairly doting parent, though this is simply because he believes strongly that they should not live life restricted by royalty, and that they are granted a choice in whatever it is they want to do. This idea came from the fact that he was an only child, with no real choice of becoming king or not. He did not want his kids to face the same issue, so if they truly wanted to become king, they would campaign. Overall, Joukamachi Dandelion doesn’t present overly deep themes, but is definitely very good at showing coming of age, values and perspective of its characters, especially within limited time. The art style is mega appealing, and it is generally good at being a unique, comedic, fun, and rewarding slice of life experience. I still don’t know why they chose dandelions, but one thing to note is that it grew in a different place than where it was seen before, perhaps representing change and progress. It may also symbolise Akane, who before was enclosed in her own shell, but now open to the world. Now only one thing bothers me… Does Karen like Akane? Poll: Who has the coolest power?